Whenever I read the short book of Philippians, I am struck by the apostle Paul’s gratitude and corresponding joy. Whether or not you celebrate a particular day of Thanksgiving, take the time this week to read the short book of Philippians—focusing on Paul’s thankful attitude and the joy that flows from this attitude. Now, think about the circumstances he faced as he wrote, especially his imprisonment. Chapter 1 It’s me, Paul. So…I guess there’s not much to say…not much hope. While you are enjoying your freedom, here I sit chained to a prison guard. This stinks… and there is nothing I can accomplish from here. Not only can I do nothing to reach out to and share with people, but there are lots of people out there preaching wrong things, undoing the good I’ve tried to do. It irks me, and I am totally depressed about this. Chapter 2 Nobody really cares about me…everyone is just thinking about themselves. Well, except maybe Timothy and now he’ll likely go to you and then you will “need” him. Sheez…what else do you want? Of course, I do have Epaphroditus, my one fellow worker and friend. You might as well take him too while you’re at it. Besides, while here trying to help me out he went and got sick on me. It’s just one lousy thing after another. Chapter 3 You know I had a lot going on before all this. I was somebody significant…but I’ve really lost everything now. God must hate me. I’ve tried to give everything…and look where it’s gotten me. There’s really not much more I could possibly do ..it’s over …and besides–look where sacrifice has gotten me anyway. In jail. Just sitting here–shackled. Chapter 4 And…if all this is not enough, my “friends” Euodia and Syntyche can’t even get along. For cryin’ out loud…. All the whining. Will someone tell them to shut it? Can’t anybody get along anymore? Problems everywhere. And I’m tired, hungry and poor to boot. I’d ask for help, but you’d probably just respond like everybody else has. When I asked before, almost no one wanted to help. Well, gotta go…not feeling so good. And the more I remember all this bad stuff the worse I feel. Maybe I’ll get lucky and die. Meanwhile, I sit here chained to a stinkin’ guard..
Now ask youself….what would your letter sound like? This is a convicting and challenging question for me. Would it be as you read the book of Philippians in your Bible?…Or would it be written more like the “rewrite” above? The difference between the two lies in our attitude of gratitude—or lack thereof. May you have a week (and life) filled with gratitude and the overflowing joy that follows. Happy Thanksgiving. We were pulling into Boston, with our car fully packed. The year was 1987 and we were heading to what would become our new home. We had our three children in tow, one dog, a few belongings and wondered what this new chapter of our life would bring. I looked back at the children and noticed that our usually happy Sam, then four years old, was quite melancholy. I inquired as to the sadness of his demeanor. His reply took me off guard. Let me give you some background before I tell you his reply. Sam was quite good at entertaining himself. Though the children didn’t watch a lot of television, they did have a few favorites. I thought Sam, as a youngster, would enjoy the usual Sesame Street type of programming. However, he had no interest in such shows. For Sam, even as a toddler, was mesmerized by anything having to do with sports. I can still picture him in his high chair, joyfully watching football. By the time he was four years old, he knew a lot about sports, even sports trivia. Thus, I should not have been so surprised at Sam’s response as we approached our new home. He responded to my inquiry with a sigh as he uttered, “Oh no, now I have to be a Patriots’ fan.” This little four year old was realizing his move would come at a price. He had been mulling over in his mind the “fact” that he would now be an official fan of a team that was at the time – in a word – horrendous. During the next several years New England Patriots paraphernalia was amazingly cheap. In fact, you would think the organization would pay you to buy it. You only wore a T-shirt if you had a jacket on that zipped up so it couldn’t be seen. 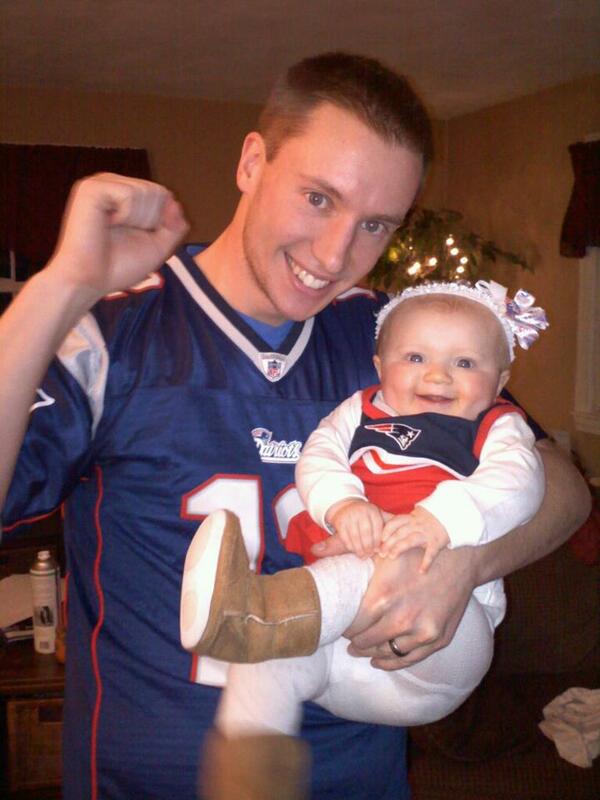 It was not encouraging to be a Patriots’ fan. However, over time, how things can change! It is possible to go from worst to first. (or second 😦 ….I’m still a little tender from last night’s loss in the Super Bowl) Now, my grown up son and his daughter proudly display their sports team loyalty. We do not want you to be uninformed, brothers, about the hardships we suffered in the province of Asia. We were under great pressure, far beyond our ability to endure, so that we despaired even of life. Indeed, in our hearts we felt the sentence of death. But this happened that we might not rely on ourselves but on God, who raises the dead. Paul had experience severe hardships as he followed Jesus. His trials called him back to reliance on God. How easy it is, when things go well, to become self-reliant – and less mindful of our utter dependence on God for every breath and every step we take. The next scripture has encouraged me again and again. While similar to the previous scripture 2 Cor. 12:7-10, encourages me by promising me that my weaknesses can actually become my strengths. To keep me from becoming conceited because of these surpassingly great revelations, there was given me a thorn in my flesh, a messenger of Satan, to torment me. Three times I pleaded with the Lord to take it away from me. But he said to me, “My grace is sufficient for you, for my power is made perfect in weakness.” Therefore I will boast all the more gladly about my weaknesses, so that Christ’s power may rest on me. That is why, for Christ’s sake, I delight in weaknesses, in insults, in hardships, in persecutions, in difficulties. For when I am weak, then I am strong. So, I figure if I hang in there, with true faith, any situation can become one that works for God’s glory, and my growth. True joy and delight comes from this reality. 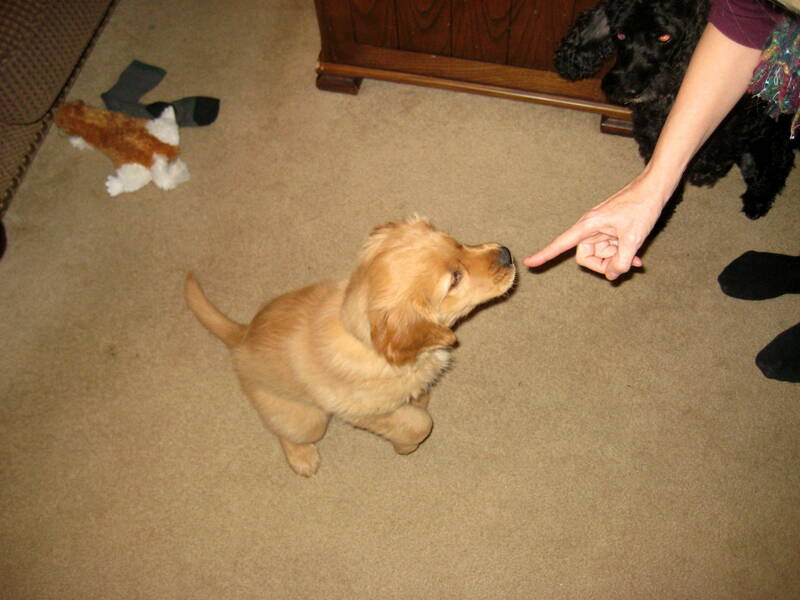 Obedience training has begun. My husband is working with our little pup, teaching him four basic commands – sit, stay, come and no. These are the commands, that when fully trained, Denver should respond to immediately – and always. I look forward to his increased obedience as he matures. He will not only be pleasant to live with, but he will be much safer. I will be able to count on stopping him b efore he goes out in the road, or swallows a toy, or eats a shoe. I can know he will come in when called, so he won’t get lost. Basic obedience will also allow him to fulfill the “work” he is bred to do- upland hunting. When he finds pheasant in the field in a few months, he will likely experience the joy of doing the job for which he was created. I see very clearly with Denver how obedience is taught, learned and practiced over and over again. When children learn obedience (through what they suffer), they (and others around them) are always so much happier afterward. I love my grandchildren! They are so much fun, and they are great kids. I had to laugh as I heard the antics of my youngest grandson, Micah, a few days ago. Micah has such a sweet, tender conscience and can carry on conversation way beyond his (almost) two years of age. 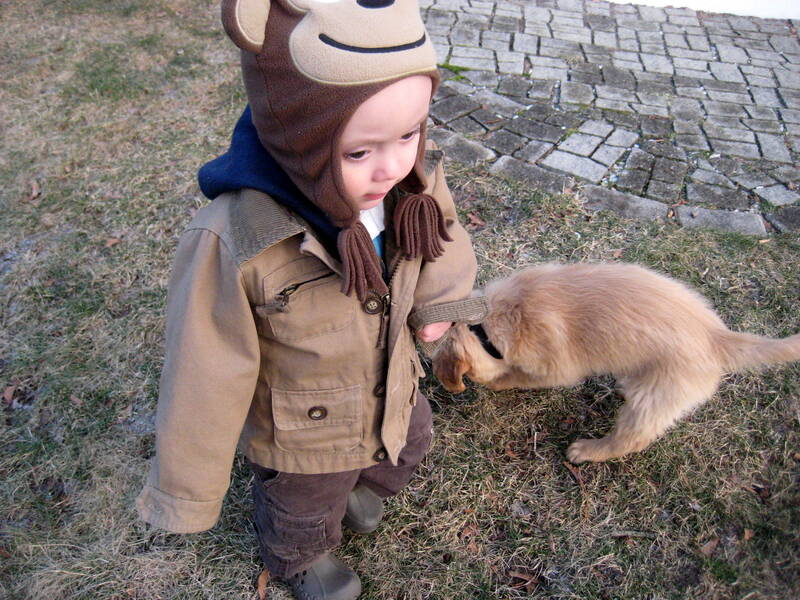 However, as he nears the age of two, this struggle for obedience can be humorous to watch. Earlier this week he said “no” to his dad. That, of course, was not acceptable. His daddy then told him he was not to tell daddy “no” (and if he did he would be punished). He then looked away from his dad, into his mommy’s eyes and calmly said, “No, Mommy!” He just wanted to “clarify” (or test) what it meant to be obedient. Sometimes, obedience is outward, without being inward. After being told by mom that he could not watch the movie “Polar Express” again, since he had already watched it that day, he walked away mumbling under his breath, “I will watch ‘Pola Press’; I can watch ‘Pola Press’!” Obedience is often quite hard. That’s why it’s called obedience. If it wasn’t difficult, it could just be called “doing what we want to do”. We can, like Micah, do the right thing, but it can take a while for our attitudes to catch up to our actions. It’s a good start! This principle was further illustrated by a conversation I had with a dear friend last week. She had struggled for a while with feeling surrendered to God after experiencing several difficult situations. She simply could not find much joy in her walk with God. However she kept walking. Several months ago, she was able to regain her joy in her relationships, beginning with her relationship with God. The change in her attitude is quite evident in her conversations, her expression and her entire demeanor. She is able to think and process without the angst that was previously there. I asked her what had brought her to this newfound peace. Her answer was simply, “You know, obedience is under-rated.” She went on to explain that in her struggle, she had maintained her love and respect (fear of God) and had decided that she would be obedient to God and His word despite how she felt. It was not always “smooth”, but she kept on doing the things that were right. In time, God blessed that obedience and she found her “heart” again. Therefore, my dear friends, as you have always obeyed–not only in my presence, but now much more in my absence–continue to work out your salvation with fear and trembling,  for it is God who works in you to will and to act according to his good purpose. If we keep on obeying, out of awe for God, He will give us the will (the want to, the heart) to carry out His purposes for which we were created. When we don’t “feel” like doing it –keeping on obeying God will take us through the “muck and mire” that can get into our hearts and get us to the other side. There, as with Denver, and my grandchildren, we will be safe, happy, and able to fulfill the purposes for which we were created. Never under-rate simple obedience.